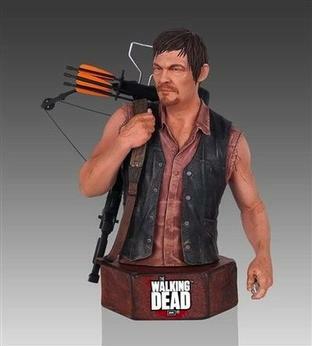 Straight from The Walking Dead TV series to your shelf, it's The Walking Dead Daryl Dixon Mini Bust! This beautiful and intricate bust stands 6 3/4-inches tall and was digitally sculpted and cold cast using only the highest quality synthetic polystone. From Daryl's signature sleeveless tee-shirt to his deadly hunting crossbow, no detail has been overlooked by Gentle Giant! A limited edition collectible, The Walking Dead Daryl Dixon Mini Bust comes individually numbered and includes a matching certificate of authenticity.